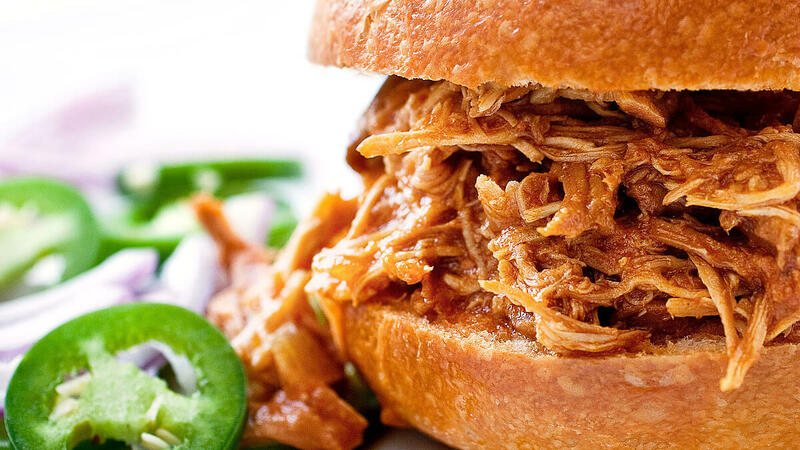 Have sliced jalapenos, sliced red onions and some sour cream on hand to top this slow-cooked barbecue pulled chicken. Always cook chicken or turkey to a safe internal temperature of at least 165°F. See safe cooking instructions below. Cover and refrigerate for up to 3 days or freeze for up to 1 month. Cook to a safe internal temperature of at least 165°F. Always use a meat thermometer inserted into the thickest part of the chicken or turkey to determine the temperature. Do not rely solely on suggested cooking times. Cooking appliances vary in temperature and cooking times are a guide only.